Abdomino-pelvic ultrasonographic (U/S) to detect the site and the size of the impalpable testis, and to compare the accuracy of U/S in comparison to laparoscopic findings. All patients with undescended testis were examined under a general anaesthetic with muscle relaxation. On the affected side, the scrotum was palpated for the testis or gubernacular structures. If the testis remained impalpable an effort was made to 'milk' the testis down from the inguinal canal with one hand while the other blocked retraction. If no testis (64 patients) was palpable laparoscopy was performed. One stage laparoscopic orchiopexy: This technique was performed in 26 testes (20 low intra-abdominal and 6 at the deep inguinal ring) [Figure 1], [Figure 2], [Figure 3]. The testicular vessels were freely dissected from peritoneal attachment to get adequate length, and the testes were brought into the scrotal sac without tension through a direct route (one stage laparoscopic-assisted orchiopexy) in 14 impalpable testes [Figure 3] and the testes were delivered through a scroto-peritoneal port and fixed in a dartos pouch (12 testes) [Figure 4]. Staged Fowler-Stephens orchiopexy: This technique was performed in 17 high intra-abdominal testes. In the first stage, metal clips were applied to the testicular vessels 3 cm above the testis without any mobilisation. In the second stage (6 months later), the vessels are severed between clips and the testes were brought down on the artery to the vas with a wide base of peritoneal attachment to the scrotal sac through the direct route. Open orchiopexy [Figure 5] (8 testes). Laparoscopic orchidectomy [Figure 6] was done in 5 abdominal atrophic testes with hypoplastic vessels. Excision of atrophied remnants of testes through inguinal exploration and histopathology of the removed specimen [Figure 7] (4 atrophied testes). Laparoscopy was performed as a diagnostic and a therapeutic tool. The results of diagnostic laparoscopy [Table 1] were: 3 testes (4%) were absent, 18 (24%) were inside the upper part of the inguinal canal [Figure 1], 14 of them were viable and with adequate size and calibre of spermatic vessels and vas. 8 testes entered the deep inguinal ring, managed by open orchiopexy [Figure 5], while 6 testes were seen at the deep inguinal ring [Figure 3] and one stage laparoscopic orchiopexy was done for them, while 4 testes were atrophic with hypoplastic vessels, and they were excised through inguinotomy and histopathology was done for them [Figure 7]. Twelve testes (16%) were diagnosed as vanished testes (intra-abdominal blind ended vessels and vas at the internal ring). No further intervention was done for them as the finding was confirmatory of absent testis. The remaining 42 impalpable testes were intra-abdominal, 5 were atrophic (6.7%) and laparoscopic orchidectomy [Figure 6] was done for them, 17 testes (22.7%) were high intra-abdominal >3 cm from the deep inguinal ring, so staged Fowler-Stephens was done. 20 testes (26.6%) were low intra-abdominal [Figure 2] with acceptable size and adequate length of spermatic vessels and vas, managed by one stage laparoscopic orchiopexy [Figure 3]. There were no major complications in any of the procedures. Williams EV, Appanna T, Foster ME. Management of the impalpable testis: A six year review together with a national experience. Postgrad Med J 2001;77:320-2. Gatti JM, Ostlie DJ. The use of laparoscopy in the management of nonpalpable undescended testes. Curr Opin Pediatr 2007;19:349-53. Barqawi AZ, Blyth B, Jordan GH, Ehrlich RM, Koyle MA. Role of laparoscopy in patients with previous negative exploration for impalpable testis. Urology 2003;61:1234-7. Rosito NC, Koff WJ, da Silva Oliveira TL, Cerski CT, Salle JL. Volumetric and histological findings in intra-abdominal testes before and after division of spermatic vessels. J Urol 2004;171:2430-3. Kucheria R, Sahai A, Sami TA, Challacombe B, Godbole H, Khan MS, et al. 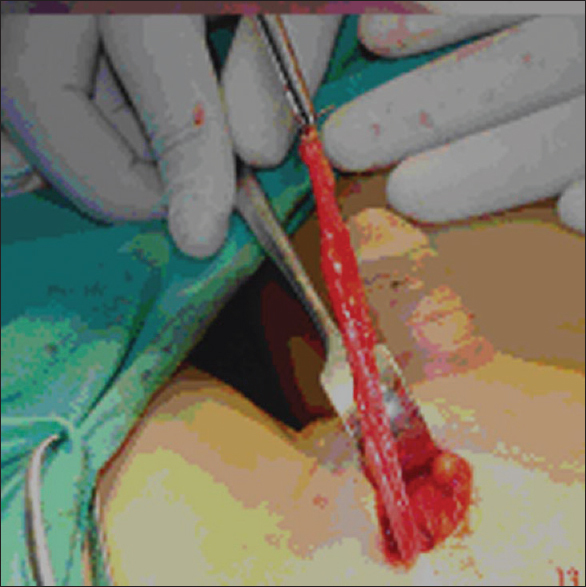 Laparoscopic management of cryptorchidism in adults. Eur Urol 2005;48:453-7. Chew G, Hutson JM. Incidence of cryptorchidism and ascending testes in trisomy 21: A 10 year retrospective review. Pediatr Surg Int 2004;20:744-7. Cortesi N, Ferrari P, Zambarda E, Manenti A, Baldini A, Morano FP. Diagnosis of bilateral abdominal cryptorchidism by laparoscopy. Endoscopy 1976;8:33-4. Quoted from BJM Int 2001;87:490-3. Scott JE. Laparoscopy as an aid in diagnosis and management of the impalpable testis. J Pediatr Surg 1982;17:14-6. Alam S, Radhakrishnan J. Laparoscopy for nonpalpable testes. J Pediatr Surg 2003;38:1534-6. Argos Rodriguez MD, Unda Freire A, Ruiz Orpez A, Garcia Lorenzo C. Diagnostic and therapeutic laparoscopy for nonpalpable testis. Surg Endosc 2003;17:1756-8. Baker LA, Docimo SG, Surer I, Peters C, Cisek L, Diamond DA, et al. 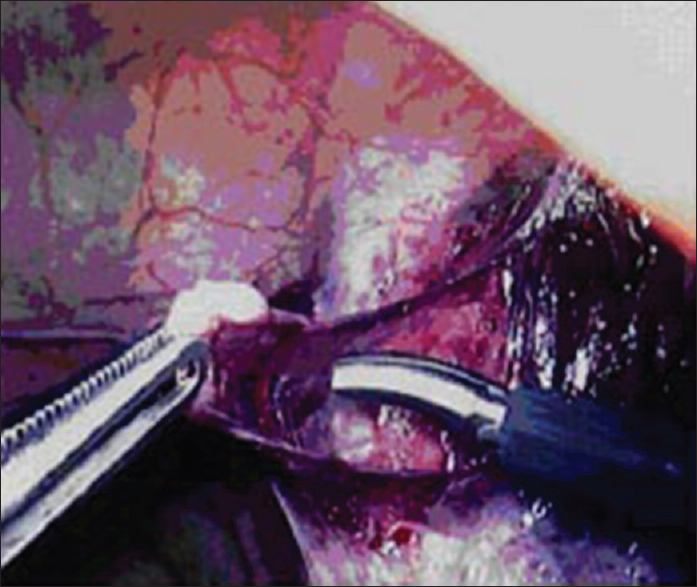 A multi-institutional analysis of laparoscopic orchidopexy. BJU Int 2001;87:484-9. Cortes D, Thorup JM, Lenz K, Beck BL, Nielsen OH. Laparoscopy in 100 consecutive patients with 128 impalpable testes. Br J Urol 1995;75:281-7. Tennenbaum SY, Lerner SE, McAleer IM, Packer MG, Scherz HC, Kaplan GW. Preoperative laparoscopic localization of the non palpable testes; a critical analysis of a 10-year experience. J Urol 2000;164:154-5. 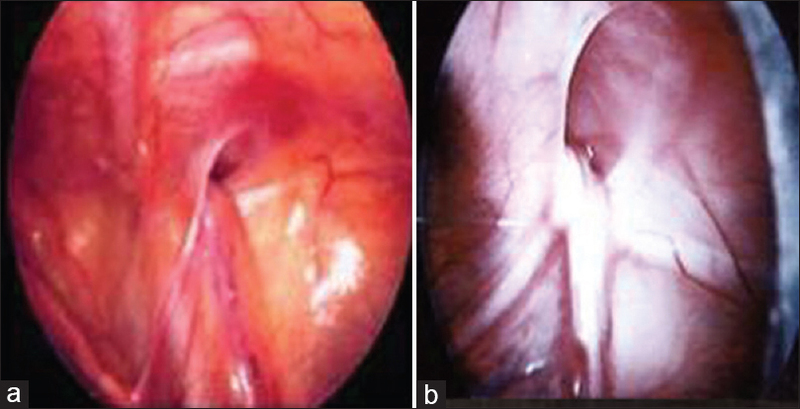 Chang B, Palmer LS, Franco I. Laparoscopic orchidopexy: A review of a large clinical series. BJU Int 2001;87:490-3. Cisek LJ, Peters CA, Atala A, Bauer SB, Diamond DA, Retik AB. Current findings in diagnostic laparoscopic evaluation of the nonpalpable testis. J Urol 1998;160:1145-9. Lotan G, Klin B, Efrati Y, Bistritzer T. Laparoscopic evaluation and management of nonpalpable testis in children. World J Surg 2001;25:1542-5. Ayub K, Williams MP. A simple alternative technique of orchiopexy for high undescended testis. Ann R Coll Surg Engl 1998;80:69-71. Jawad AJ. Scroto-peritoneal port for laparoscopic orchidopexy. Pediatr Surg Int 1998;13:460-1. Malone PS, Guiney EJ. A comparison between ultrasonography and laparoscopy in localising the impalpable undescended testis. Br J Urol 1985;57:185-6. Elder JS. Ultrasonography is unnecessary in evaluating boys with a nonpalpable testis. Pediatrics 2002;110:748-51. Siemer S, Humke U, Uder M, Hildebrandt U, Karadiakos N, Ziegler M. Diagnosis of nonpalpable testes in childhood: Comparison of magnetic resonance imaging and laparoscopy in a prospective study. Eur J Pediatr Surg 2000;10:114-8. Desireddi NV, Liu DB, Maizels M, Rigsby C, Casey JT, Cheng EY. Magnetic resonance arteriography/venography is not accurate to structure management of the impalpable testis. J Urol 2008;180:1805-8. Yeung CK, Tam YH, Chan YL, Lee KH, Metreweli C. A new management algorithm for impalpable undescended testis with gadolinium enhanced magnetic resonance angiography. J Urol 1999;162:998-1002. Cain MP, Garra B, Gibbons MD. Scrotal-inguinal ultrasonography: A technique for identifying the nonpalpable inguinal testis without laparoscopy. J Urol 1996;156:791-4. Yu TJ, Lai MK, Chen WF, Wan YL. Two-stage orchiopexy with laparoscopic clip ligation of the spermatic vessels in prune-belly syndrome. J Pediatr Surg 1995;30:870-2. Radmayr C, Oswald J, Schwentner C, Neururer R, Peschel R, Bartsch G. Long-term outcome of laparoscopically managed nonpalpable testes. J Urol 2003;170:2409-11.